This little Psalter and hymn-book (originally two separate manuscripts) has an ownership inscription of the Augustinian Canonesses of Campsey Ashe, a few miles east of Wickham Market, between Saxmundham and Ipswich, in Suffolk. 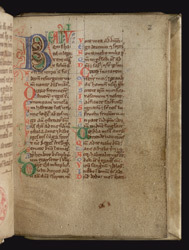 The Psalter was written within a few decades of the founding of the Priory c.1195, so it may have belonged to one of the founding nuns. This psalter is unusual because it provides just the first few words of each verse: clearly it was intended for someone ho knew the psalms by heart, and just needed cues or prompts rather than the entire text.